The first quarter of the project was spent on getting familiar with relevant policies and standards, understanding the wider strategic framework the project sits within. Planning and carrying out various engagement activities in Brora as well as analysing questionnaire data and compiling a summary report for Golspie (SCP had carried out some engagement work in Golspie prior to the Community Engagement Team’s involvement) were also among the main tasks during this period. Engagement activities in Brora concluded and final Community Plans for Brora and Golspie were finalised. Community engagement commenced in Helmsdale, Creich and Kinlochbervie, and workshops at secondary schools and wellbeing hubs were conducted. Final open community workshops were carried out in Helmsdale, Creich and Kinlochbervie during June. Subsequent tasks in this quarter were centred around writing and compiling the final Community Plan documents for those three localities. 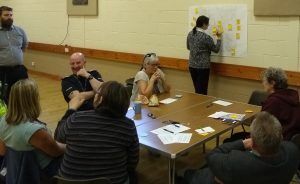 Initial planning and early engagement activities for the community engagement in Ardgay & District, Assynt and Melness-Tonuge-Skerray also took place. An open workshop and drop-in-surgery in Ardgay also happened in August. Final workshops and surgeries were carried out in Lochinver and Tongue, as well as more focussed work with people with some protected characteristics at the Kyle Centre. The remainder of the quarter was spent on writing up results, designing the Community Plans and planning for the next round of engagement in Durness, Edderton and Scourie. Workshop and surgeries were carried out in Durness, Edderton and Scourie during December. Community Plans were finalised and planning for the community engagement in Dornoch, Lairg and Rogart took place.